FLASHBACK! Tim and Brandon give their thoughts on Guy Delisle’s Pyongyang, DVD movie Justice League: The New Frontier, Spider-Man One More Day, and Writing for Comics with Peter David! 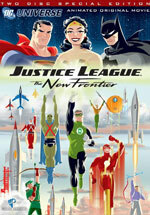 Host Anthony Desiato founds the Alternate Realities Book Club with Phil Hussain, Rich Roney, and Mike Sangregorio to discuss the Darwyn Cooke masterpiece DC: THE NEW FRONTIER. The group examines the story’s sprawling scope, human heroes, and lasting legacy. Comic Tube is Celebrating their two year anniversary by releasing this Prequel originally aired on the Geeks Unite Network by reviewing justice league the new frontier.